Although their campaign has concluded, if you would still like to make a donation to support Scope & Scalpel, you may always do so here. In 1955, a "gripe session" between Pitt Med students at a local bar turned into an idea to share with the public the unique challenges of medical school. Thus was born the first Scope and Scalpel musical production -- full of hidden talents, musical parodies, and the occasional friendly jab at faculty and staff. The tradition has carried on for over 6 decades, making Scope and Scalpel the longest running annual theatrical production in Western Pennsylvania. The Class of 2018 is proud to carry on the tradition with the 64th Scope and Scalpel! We can't believe that our 4 years at Pitt Med are winding down. It seems like just yesterday we were honored at our white coat ceremony -- how far we have come! Donate!! It is with the generous support of parents, faculty, alumni, and friends that Scope and Scalpel continues to provide a humorous outlet to share the triumphs and tribulations of our time at Pitt Med, and lets us showcase the talents of our class. Every dollar raised through this campaign will be used to cover production costs, including venue, costumes, props, sets, program and playbill printing, and more. Spread the word. We understand that not everyone is able to contribute financially, but you can always help us by sharing the link to this page! Come to our show. More details of this year's theme, ticket sales, and show information is forthcoming. Please cheer us on as we say a final farewell to Pitt Med Class of 2018. Take a look at ALL 63 of our prior playbills HERE (scroll down to the "Detailed Contents" section). 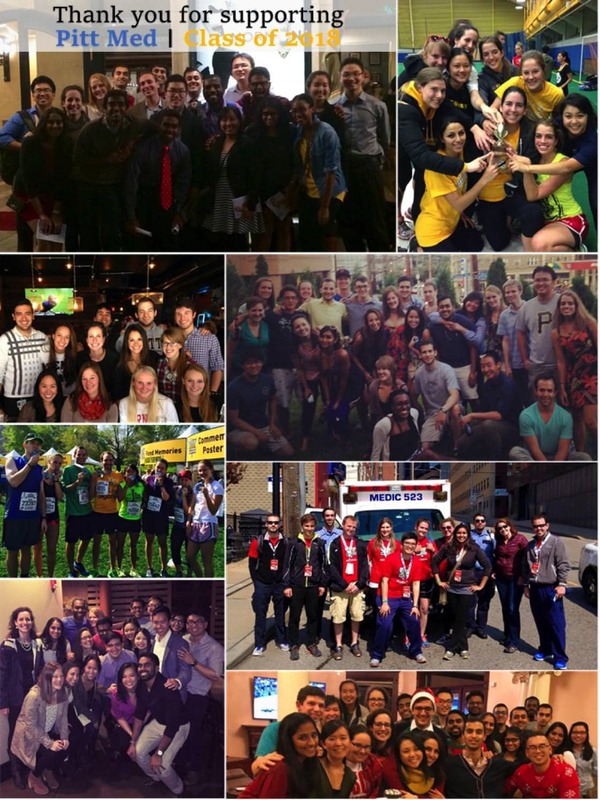 Can you spot your Pitt Med year? Your dreams are big, and so is that stack of MCAT prep books. $10 gets you one extra (imaginary) point on the bio section, and a warm welcome from your future colleagues. You know what year you are based on the color of your white coat. Don't let that random brown stain get you down, $25 will fund a communal bottle of bleach and several rounds of laundry. With great power comes great responsibility. For $100, you can help support your friendly medical student. Remember, the one you left in the resident lounge 3 days ago without dismissing for the day? Yes, he is still there. Your medical student has diligently run the CHA2DS2-VASc, HAS-BLED, ASCVD, CURB-65, APGAR, MOCA, CAGE, WASP, GCS, and PHQ-9 assessments on your entire floor. Please consider contributing to her SANITY score with a generous $250 donation. Budgeting and expenses have now become a part of your job, so you know first hand how difficult it can be to adequately supply your team with the equipment they need. But $500 can buy....CHAIRS! And tables, and buckets, and surgical caps, and....basically all the props we'll need in the show. Could you imagine that a four-letter word could carry so much power, respect, and (obviously) a guaranteed mention in this year's show?? A contribution of $1000 will make sure that you watch in style -- padded seats, air conditioning, an assortment of baked goods and sodas available for purchase to be consumed outside of the venue during intermission only, please -- yes it can all be yours.